Reninoma causes hypertension and hypokalemia via hypersecretion of renin. We describe a case of reninoma and provide a review of the literature. The subject presented with syncope and had hypokalemia, long QTc and hypertension with concentric left ventricular hypertrophy. 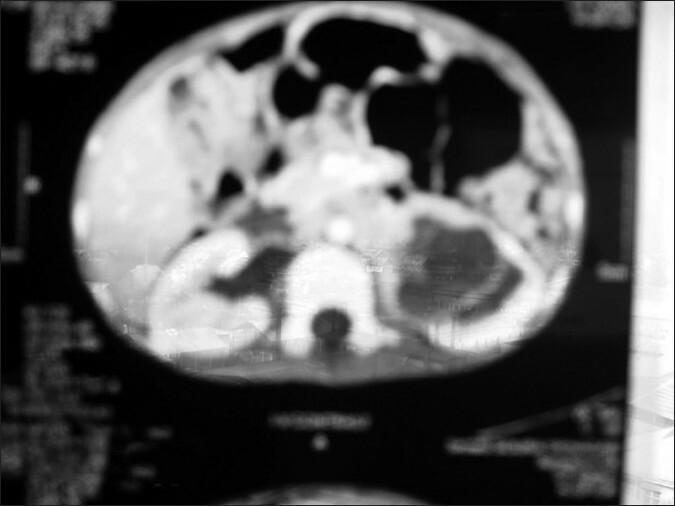 Imaging studies revealed the presence of a lesion in the renal cortex, which, on immunohistochemistry, was identified as a juxta-glomerular cell tumor (Reninoma). Following nephrectomy, the blood pressure and hypokalemia normalized. 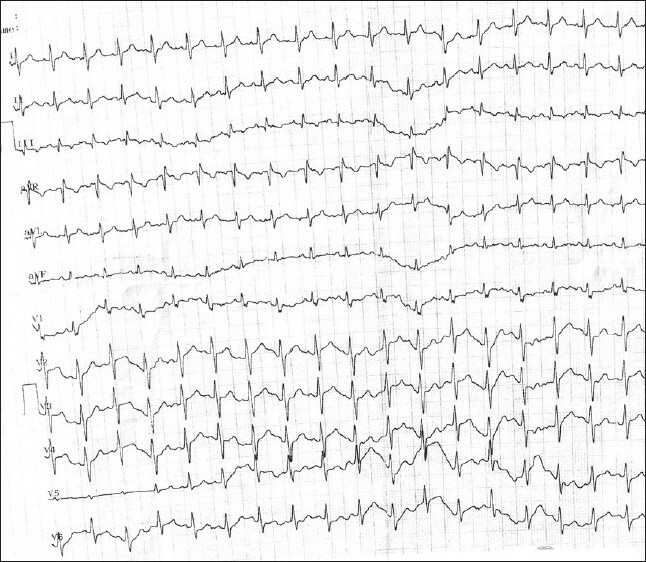 An 8-year-old, thin, lean boy presented with a history of two episodes of syncope. On examination, pulse rate was 110 beats per minute and the blood pressure was 210/110 mmHg. There was no radio-femoral delay. A heaving apex in the fifth intercostal space inside the mid-clavicular line, a wide, but not-fixed split S2 with normal P2 and a grade II/VI systolic murmur at the apex were noted. On abdominal examination, a renal bruit was heard on the left side. Neurological examination and fundus were normal. 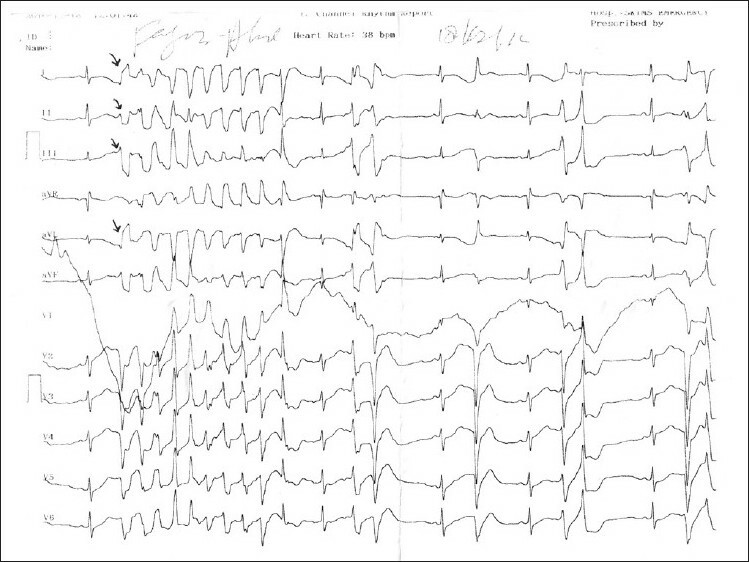 His electrocardiogram revealed sinus tachycardia with corrected QT interval of 520 msec and occasional premature ventricular complexes [Figure 1] and [Figure 2]. There was no family history of deafness or sudden death. Laboratory studies were remarkable for serum sodium 136 mEq/L, potassium 2.1 mEq/L, chloride 99 mEq/L, bicarbonate 31 mEq/L, blood urea 22 mg/dL and serum creatinine 0.8 mg/dL. Serum calcium, 24-h urinary vanillyl mandelic acid (VMA) levels and complete blood counts were within normal limits. Results of the urinalysis were normal. Echocardiography revealed concentric left ventricular hypertrophy and mild mitral regurgitation. There was no evidence of left ventricular outflow tract obstructive disease. The patient initially received intravenous magnesium and potassium, nitroglycerine, oral beta blockers and angiotensin receptor antagonists. His QTc normalized, premature ventricular ectopics disappeared, blood pressure got controlled and the patient became asymptomatic. Renal ultrasound Doppler was suggestive of replacement of left kidney by a necrotic mass (5 cm Χ 4.8 cm), with invasion of the left renal artery with normal vascular flow profile. A contrast enhanced computed tomography scan of the abdomen confirmed a cystic mass replacing the left kidney and compressing the left renal vein, with normal adrenal glands. A differential diagnosis of Bosnaik type IV cyst and Wilm's tumor were considered [Figure 3]. The patient was referred for resection of the left renal mass. Nephrectomy was performed and a histopathological examination of the specimen revealed features suggestive of reninoma [Figure 4]. The post-operative period remained uneventful. Patient's blood pressure became normal. His symptoms resolved and he is asymptomatic on one and half years follow up. 1. Still JL, Cottom D. Severe Hypertension in Childhood. Arch Dis Child 1967;42:34-9. 2. Gordon RD. Mineralocorticoid hypertension. Lancet 1994;344:240-3. 3. Abdullah N, Khawaja K, Hale J, Barrett AM, Cheetham TD. 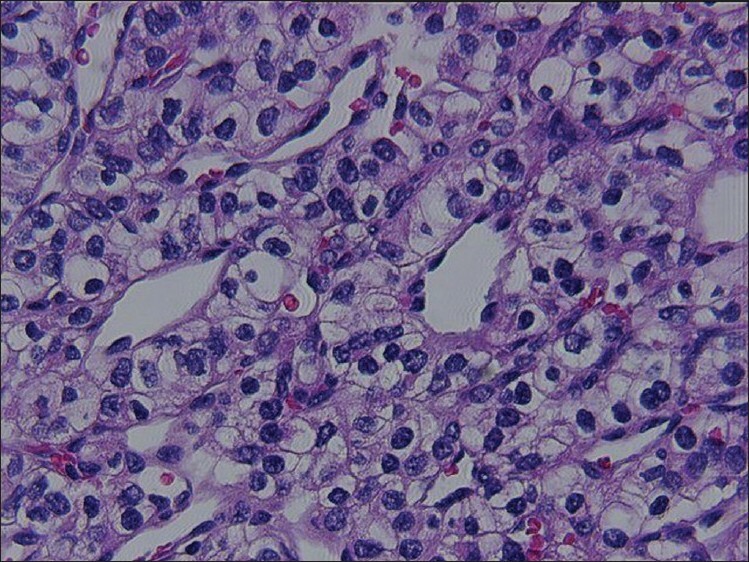 Primary aldosteronism with normokalaemia secondary to an adrenal adenoma (Conn's syndrome) in a 12 year-old boy. J Pediatr Endocrinol Metab 2005;18:215-9. 4. Flynn JT. Evaluation and management of hypertension in childhood. Prog Pediatr Cardiol 2001;12:177-88. 5. Camberos A, Bautista N, Rubenzik M, Applebaum H. Renal artery stenosis and pheochromocytoma: Coexistence and treatment. J Pediatr Surg 2000;35:714-6. 6. Garel L, Robitaille P, Dubois J, Russo P. Pediatric case of the day. Reninoma of the left kidney. Radiographics 1993;13:477-9. 7. Ganguly A, Gribble J, Tune B, Kempson RL, Luetscher JA. Renin-secreting Wilms' tumor with severe hypertension. Report of a case and brief review of reninsecreting tumors. Ann Intern Med 1973;79:835-7. 8. Robertson PW, Klidjian A, Harding LK, Walters G, Lee MR, Robb-Smith AH. Hypertension due to a renin-secreting renal tumour. Am J Med 1967;43:963-76. 9. Kevin F, TraciI W, Kelly WM, Hendrickson RJ, Mengshol S, Cadnapaphornchai MA. An unusual cause of pediatric hypertension. J Pediatr 2007;151:206-12.